40W, 10" bass combo that delivers true Ampeg tone at volume levels ideal for practice and rehearsal. With Ampeg's all-new grinding Bass Scrambler overdrive, true 60-degree monitoring angle with accessible front-facing controls and dedicated silent practice features, the BA-110 is perfect for practice, rehearsal or smaller gigs. 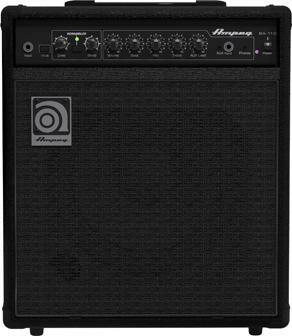 Ampeg’s BA-110 10″ Bass Combo delivers true Ampeg tone at volume levels ideal for practice and rehearsal. With Ampeg’s all-new grinding Bass Scrambler™ overdrive, true 60-degree monitoring angle with accessible front-facing controls and dedicated silent practice features, the BA-110 is perfect for practice, rehearsal or smaller gigs.